The Estée Lauder Companies is proud to announce the 20th Anniversary of its global Breast Cancer Awareness (BCA) Campaign. This year’s theme, Courage. Believe in a world without breast cancer. Know we’re here until it’s true. highlights the Company’s 20 year commitment to defeating breast cancer through education and medical research. This year, The BCA Campaign also pays tribute to the life and legacy of BCA Campaign Founder and Pink Ribbon co-creator, Mrs. Evelyn H. Lauder.
. 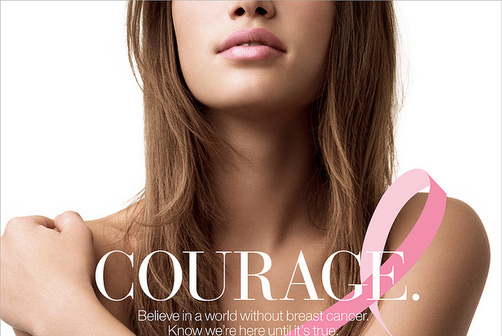 The Estée Lauder Companies’ takes great pride in raising both awareness and funds for breast health. This October, The BCA Campaign will offer Pink Products through many of The Estée Lauder Companies’ beauty brands to raise funds for The Breast Cancer Research Foundation® (BCRF), an independent, not-for-profit organization that is dedicated to funding breast cancer research. 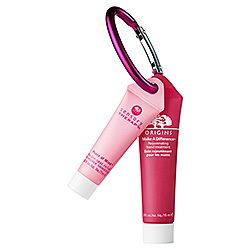 Attached please find images, pricing and descriptions of the 2012 Pink Product Collection, which spans all beauty categories: skin care, makeup, fragrance and hair care. We hope you will consider featuring these products in your October posts to support this worthy cause, as all of your efforts will make a real difference. Please let us know if you need us to send high-resolution images. Today, The BCA Campaign is active in more than 70 countries, has raised more than $35 million to fund 140 BCRF grants for medical research and this year alone supports 12 research grants across the globe. Mrs. Lauder was always so grateful for your support in helping spread awareness about the importance of breast health and early detection, and please know that we continue to be appreciative of your exceptional partnership in helping us further our mission to defeat breast cancer in our lifetime. I love when companies, especially big ones like Estee Lauder join together to help out a great cause such as breast cancer awareness. And since we're in the month of October, I thought I'd share some amazing products that not only help support the cause, but are pretty awesome too. Join the efforts to prevent and find a cure for breast cancer by shopping! 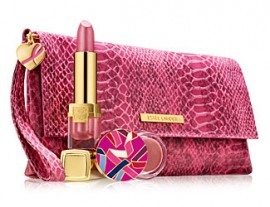 Cosmetic companies offer limited edition products and a portion of the proceeds (though most companies will make a minimum contribution regardless of sales) benefit breast cancer awareness and research foundations like The Breast Cancer Research Foundation (which was founded by Estee Lauder’s daughter in law, Evelyn Lauder), Living Beyond Breast Cancer, Cancer Care and the Young Survivor Coalition. Of course, you could always make a direct contribution to the charity of your choice. "fortified with nature's stress-busting blend of basil, peppermint, and eucalyptus, On-the-Spot Relief helps relieve tension and tightness, wishing worries away and leaving skin nice and calm. It is best for all skin types and is guaranteed to bring you Peace of Mind®. With the Rejuvenating Hand Treatment, the resurrection plant, rose of Jericho, plus skin-reviving trehalose and sea haricots work hand-in-hand to help hardworking skin rebound and recover from dramatic dehydration. An ancient oceanic flora helps repair damage due to UV exposure, daily use, and constant abuse while scutellaria extract helps even out skintone. Meadowfoam seed oil lavishes hands that have it rough with long-lasting smoothness that's never greasy, leaving chapped, cracked, splotchy skin looking and feeling softer, brighter, and more evenly toned while forming an undetectable barrier" Great for on-the go soft skin, this sells for a limited time at Sephora. 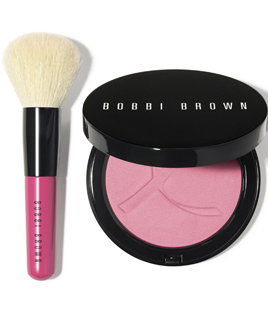 The Bobbi Brown Pink Peony Set sells for $45 and comes with a gorgeous face blender blush along with a stunning illuminating bronzing powder. The color comes with microglitter and the pink is a light sheer. I have fallen in love with the color and the look. Below is a swatch (right) of the blush and the left is the Smashbox lipstick. Smashbox Lipstick in Inspiration ($19) (swatch on top left) – Limited-edition pink shade of the Be Legendary lipstick renamed Inspiration. Purchase it here. Great product for a night out on the town. Darphin will donate $10 USD to the Breast Cancer Research Foundation for each Limited Edition Hydraskin Intensive Skin-hydrating Serum sold throughout the month of October. Potent water-veil and infusing serum instantly delivers relieving, reviving hydration to all thirsty skin. High-efficiency serum concentrate with extreme hydration complex, incorporating powerful Pomegranate penetrates onto the skin to help repair and reinvigorate critical water reserves within the surface skin cells. 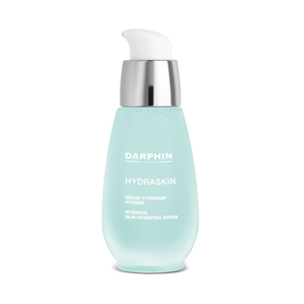 The Darphin Hydrating Serum leaves your skin feeling like pure silk. I love the blue bottle, it looks so lovely on my night stand. And since the proceeds go to breast cancer research, it's the best way to look beautiful and help a great cause. 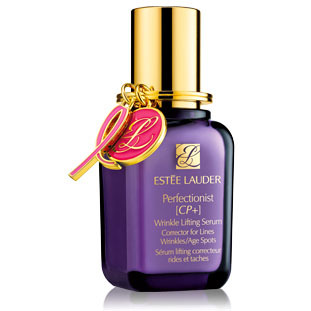 Overall I think Estee Lauder is doing a great thing by helping out in the Month of October. Make sure you check out all the above fabulous products! Disclosure: Press samples were sent to me for consideration from PR for the purpose of this review. All opinions are my own.